You can choose whichever subject you like. It may be a photo you've taken or an image you've seen and loved. Just make sure there are no copyrights attached to it! Managing colour and getting to grips with techniques can work well with any subject you fancy. You can choose photos from magazines so long as you don't take prints from your original and sell them. 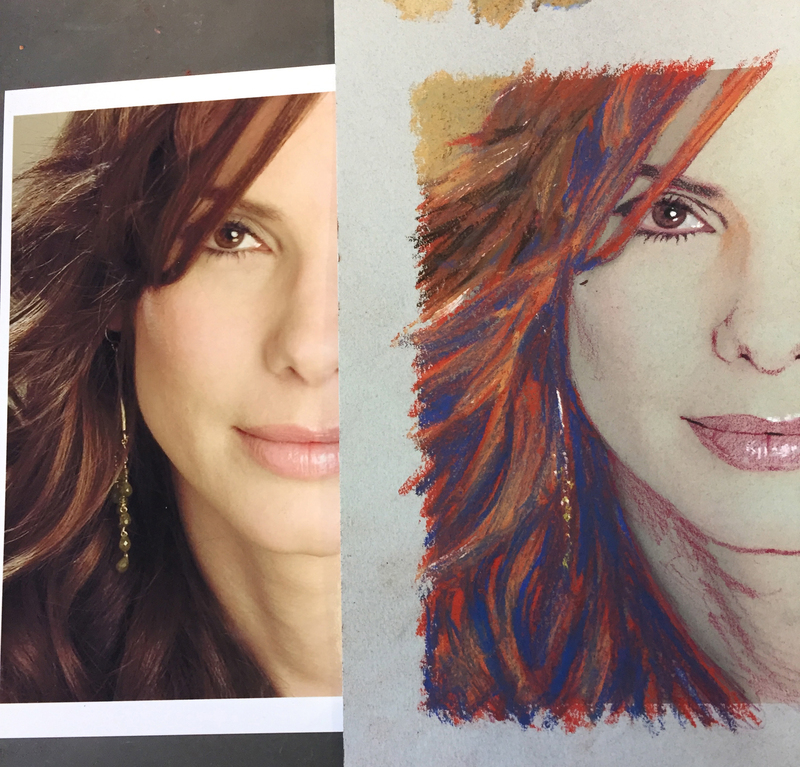 Portraying your idol is a great way to explore pastels. How many days should you do? Your portrait project should be completed in 2 days. Some take a little longer which means you can either finish off at home or book in for another day to complete your mission. The most important thing about doing these classes with me is to have fun while learning. The atmosphere here is very relaxed but intense when needed. We take a break every 1 1/2 hours so you're never too far away from a cuppa! Depending on the complexity of your portrait and your own personal confidence will determine how many days you should do. 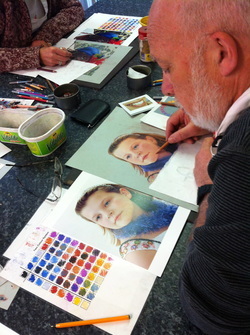 But with every portrait, you will have expert tuition every step of the way. 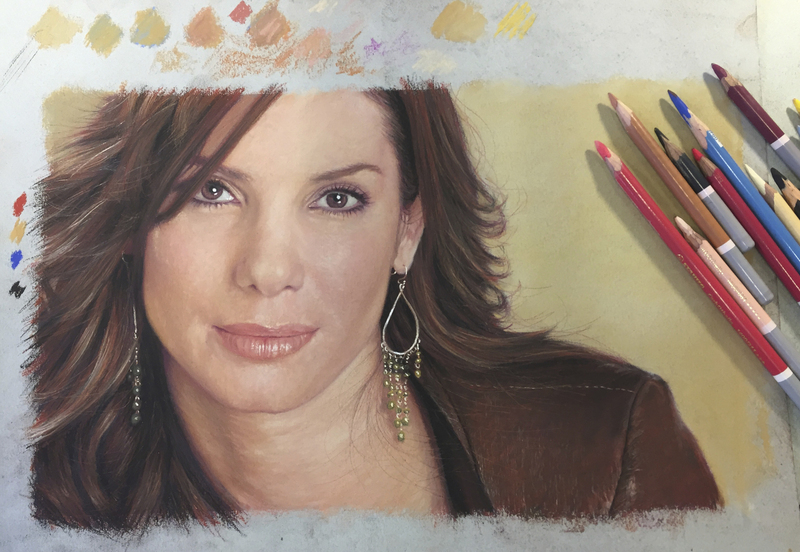 There are always options of doing a one-to-one with me as John did with his portrait of Sandra Bullock. 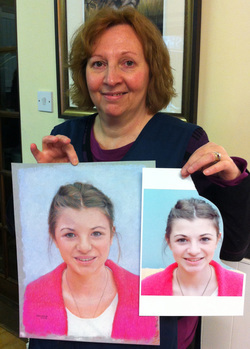 It just means you will be able to follow me from the screen, step-by-step on your portrait, as seen through my eyes. 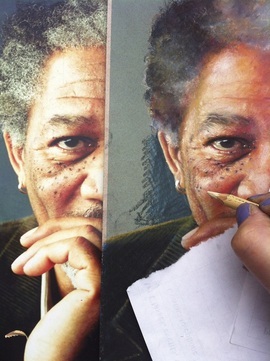 Getting the colour BROWN without using any brown chalk! 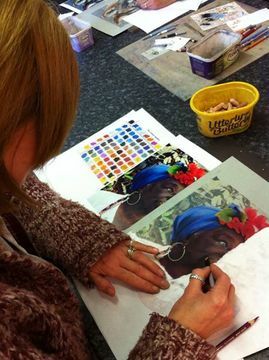 As we don't use any Grey, Green or Brown chalks the colours we arrive at have to mixed up onto the paper using our limited palette of basic primary colours and those you would use in a printer. So from the photographs, you can see that we've used red as our base as the hair is a warm brown. Then placed blue on top but stronger into the shadows. The yellow ochre will calm the mid tones of the hair down but also give it a green/brown hue which will give it a more natural look. The last stage of chalk application will be placing the blacks into the negative spaces of the hair, bringing the mid tones forward and giving it some depth. Once blended, we can then work our pencil techniques on top of the chalk to bring life into the hair with minimal effort.